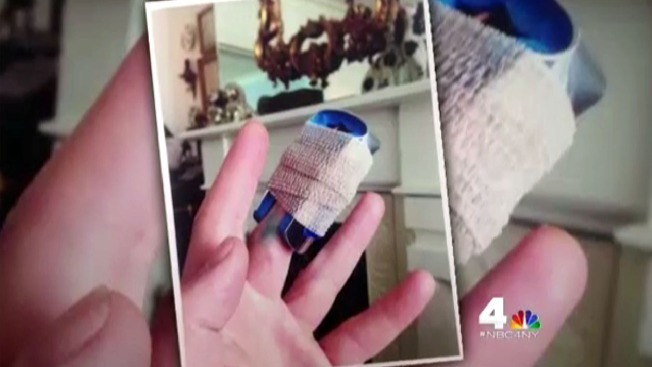 A New Jersey hospital charged a teacher nearly $9,000 to put a bandage on his middle finger, an NBC 4 New York I-Team investigation has found. Last August, Baer Hanusz-Rajkowski, of Bayonne, accidentally cut his finger with the claw-end of a hammer. He says he waited a few days for it to heal but the cut didn’t seem to be closing, so he went to the Bayonne Medical Center emergency room to ask whether he should get stitches. The nurse practitioner determined no stitches were necessary, he says. There was no X-ray either. Instead, Hanusz-Rajkowsk got hit with an $8,200 bill for the emergency room visit. On top of that, Bayonne Medical Center charged $180 for a tetanus shot, $242 for sterile supplies, and $8 for some antibacterial ointment in addition to hundreds of dollars for the services of the nurse practitioner. In total, the bill was nearly $9,000. “I got a Band-Aid and a tetanus shot. How could it be $9,000? This is crazy,” Hanusz-Rajkowski said. “If I severed a limb, I’d carry it to the next emergency room in the next city before I go back to this place." Dr. Mark Spektor, president and CEO of Bayonne Medical Center, blamed the high ER bill on Hanusz-Rajkowski’s insurance company -- United Healthcare. Almost six years ago, a company called Carepoint Health bought Bayonne Medical Center and turned it into a for-profit business. After that, Carepoint did not renew its in-network pricing contract with United Healthcare, Spektor says. He says Hanusz-Rajkowski's bill was so high because United fails to offer fair reimbursement rates. “These sticker price charges only apply to ... a minority of patients whose insurance companies have refused to negotiate fair contracted prices with us,” Spektor said. But Mary McElrath-Jones, a spokeswoman for United Healthcare, suggested Carepoint is pursuing a predatory business model that avoids cutting price deals with insurers. New Jersey law requires insurers to pay for ER treatments, whether or not there is an in-network price deal. The New Jersey Association of Health Plans, a trade association representing insurance companies, has argued Carepoint is effectively using a consumer protection law to price gouge emergency room patients. Ward Sanders, the association’s president is now calling for a price ceiling on emergency room procedures. “There’s a statute in New Jersey that deals with emergency conditions like Superstorm Sandy. But something along those lines that would prevent price gouging in the context of emergency rooms,” Sanders said. But Spektor said capping the price his emergency room can charge insurance companies would put the financial viability of the hospital in peril. When Carepoint bought the medical center, it was on the verge of bankruptcy. A 2007 economic report estimated keeping the institution open saved 1,000 jobs. “Insurance companies in the state of New Jersey particularly have had record profits last year. Billions of dollars in profits while hospitals are struggling and closing. That is the real story,” Spektor said. It’s not just ER visits that can be expensive for out-of-network patients at Bayonne Medical Center. Medicare data shows the hospital charges some of the highest prices in the nation for dozens of the most common in-patient procedures. Carepoint has also purchased hospitals in Hoboken and Jersey City -- turning them into for-profit ventures too. Since turning Bayonne Medical Center into a for-profit venture, Spektor says the hospital has become profitable. He would not reveal the facility’s profit margin on the $8,200 emergency room visit. Linda Schwimmer, vice president of the New Jersey Health Care Quality Institute, estimated the charge is more than ten times the true cost of treating a cut finger. Schwimmer wants New Jersey to create a public database where average prices for medical procedures are available for reference. “If there was a list when he walked in the door saying this is going to cost you $8,200, he would have been running down the street,” Schwimmer said, referring to the bill charged to Hanusz-Rajkowski. United Healthcare has settled its portion of the bill, about $6,640. Hanusz-Rajkowski was responsible for the balance, but after questions from the I-Team, Spektor said the hospital has written off his portion of the debt. “I understand there is no balance due on this bill,” Spektor said.